This past weekend at the IFSA Junior National Freeride competition and Ski The East Freeride Tour Finals at Jay Peak Resort in Vermont, athletes Irian Adii and Charlie Agricola received the 2019 Flyin Ryan award for exemplifying Ryan’s core values. 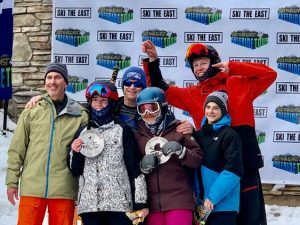 The award recipients were selected by coaches from multiple programs based on observations at Jay Peak this weekend as well as events attended during the 2019 competition season. Irian is a member of the Smugglers’ Notch Ski and Snowboard Team, and Charlie is a member of the Jay Peak Freeski and Ride Team. Additionally, Smugglers’ Notch athlete Kelton Poirier was presented a Flyin Ryan award for smart decision making in a fast moving and high pressure situation. Partway into his competition run as he was about to drop into the very challenging waterfall chute, Kelton realized that the risk level was just too high for him on that day. Instead of throwing caution to the wind and continuing against his better judgement, Kelton showed maturity beyond his years by making the difficult decision to stop and climb out of the zone. Thank you Kelton, Irian, and Charlie for setting the standard for our Freeride community! The awards were presented by IFSA/Flyin Ryan Foundation board member Bryan Salatino with assistance from 2017 and 2018 Flyin Ryan Award recipients Parker Herlihy and Matteo Campbell.